This plug-in adds encryption and encoding functions to FileMaker Pro. With Troi Encryptor plug-in you can make sure information can only be read by the persons you want. With this plug-in you can encrypt fields using the powerful 256-bit AES encryption scheme, so that your sensitive data is secure. The Encr_EncryptAES function will use AES-256 bit encryption by default. This version stays compatible with older versions though, which used 128-bit encryption: you can still use the 128-bit encryption scheme, by using a switch. The Encr_DecryptAES function will automatically detect if data previously encrypted with Troi Encryptor Plug-in is AES-128 or AES-256 and decrypt the text automatically. You don’t need to change the scripts or add any switches for this to work. Troi Encryptor Plug-in has 3 functions that enable you to easily exchange AES-encrypted data with other systems. 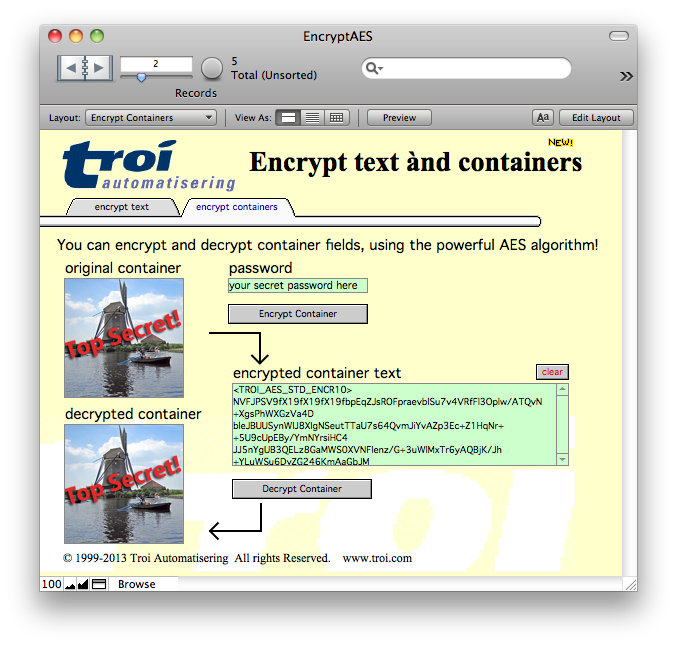 Externally AES-encrypted data can now be decrypted in FileMaker with Troi Encryptor Plug-in and vice versa! We also added an ‘-OpenSSLCompatible’ switch to the plug-in’s EncryptAES and DecryptAES functions. This facilitates the exchange of encrypted data between the plug-in and the OpenSSL functions of PHP 7 or the openssl command in a command line interface (for example the macOS terminal). In the download we added an extensive example which demonstrates how to decrypt data generated with the plug-in’s EncryptAES function with the OpenSSL functions of PHP 7, and the other way round: how to decrypt data generated by the OpenSSL functions of PHP 7 with the plug-in’s DecryptAES function. The Encr_GeneratePassword function generates a strong, random password with a specified length. The plug-in allows you to store passwords in the keychain and retrieve and delete them later, all directly from FileMaker. When you save a password into the keychain, you specify the name of the account (or user) associated with it, and optionally an extra ID, which will help you distinguish between different passwords for the same account. As the keychain is unlocked when the user logs in to the operating system, the password can later be retrieved from it without the user needing to enter the (keychain) password. You can then use the retrieved password to decrypt text in a field, for example with the Encr_DecryptAES function. A third function allows you to delete previously stored passwords from the keychain. You can compress text using the ZLIB compression. This can be decoded again, to recreate all the original higher ASCII characters. More importantly, if you use this function on encrypted text it will also be converted to a format that is safe to send over internet. The plug-in has a function ShortSafeAscii, which is a variant of the SafeAscii function. With this you can export any text field, including encrypted data, to an export file. The plug-in has a generic code function, which makes it possible to encrypt a field with the key as the parameter in FileMaker. This opens up the possibility to decrypt without the need for a script. Of course much more is possible. The best way to see if it can help you is to try it out! You are free and invited to test the plug-in before you pay. Troi Encryptor Plug-in is fully functional in demo mode, it will only stop working after 2 hours of testing. Download your copy here. Troi Encryptor Plug-in 5.0 is a major release which adds compatibility with FileMaker 17. New functionality added in this version is the possibility to decrypt text which was encrypted with OpenSSL using AES-256 encryption. We also added an extensive example which shows you how to exchange encrypted data between FileMaker and PHP OpenSSL and vice versa. In this version we also added a new Encr_GeneratePassword function, which can generate a strong, random password with a specified length. On macOS we prepared the plug-in for notarization: the plug-in can now be added to a runtime, to create a hardened FileMaker runtime app which can be notarized by Apple. Notarization gives users more confidence, as the runtime has been checked by Apple for malicious components. Tested and made compatible with FileMaker Pro 17. Added new Encr_GeneratePassword function, which can generate a strong, random password with a specified length. Also created the example file GeneratePassword.fmp12 to demonstrate all possibilities. Added PHP 7 encryption compatibility. You can now AES-256 encrypt text with the plug-in and and decrypt it with the OpenSSL functions of PHP 7. You can also decrypt text with the plug-in which was encrypted with the OpenSSL functions of PHP 7. Created new extensive example file OpenSSL.fmp12 which demonstrates how to encrypt and decrypt data for or from PHP 7. Added two php scripts for decryption and encryption in PHP 7. See the folder “Integration with PHP + websites”. The script “php7-decrypt-from-encryptor-AES256.php” decrypts text which was encrypted with Troi Encryptor 5 for PHP 7. The script “php7-encrypt-for-encryptor-AES256.php” encrypts text which can be decrypted with Troi Encryptor 5. Added new switch “-HashIterationCount=n” to the Encr_EncryptAES and Encr_DecryptAES functions so you can specify the hash iteration count used to generate the key and initialization vector. Improved command line interface compatibility of the Encr_DecryptAES function: you can now decrypt text created by the openssl command in a command line interface (for example the macOS terminal). Use the switches “-OpenSSLCompatible -KeySize=256” for this. Note that the decryption assumes the text was UTF-8 encoded. If you don’t want to decode as UTF-8 you can also add the switch “-DontInterpretAsUTF8”. (Windows) Added code signing to the plug-in for Windows. (On macOS code signing was already added in version 4.0). IMPORTANT (macOS only) The minimum supported FileMaker version is now FileMaker Pro 14. Also the minimum supported Mac OS version is now OS X 10.9 (Mavericks). You can keep using v4.x (currently v4.0.1) for older versions of FileMaker Pro or Mac OS X. Renamed the function Encr_EncryptRijndaelAES to Encr_EncryptAES. Renamed the function Encr_DecryptRijndaelAES to Encr_DecryptAES. Improved the 64-bit compatibility of the plug-in. Fixed a bug in the Encr_EncryptAES function with the (previously hidden) switch -OpenSSLCompatible, where in some cases the error code $$-50 would be returned. 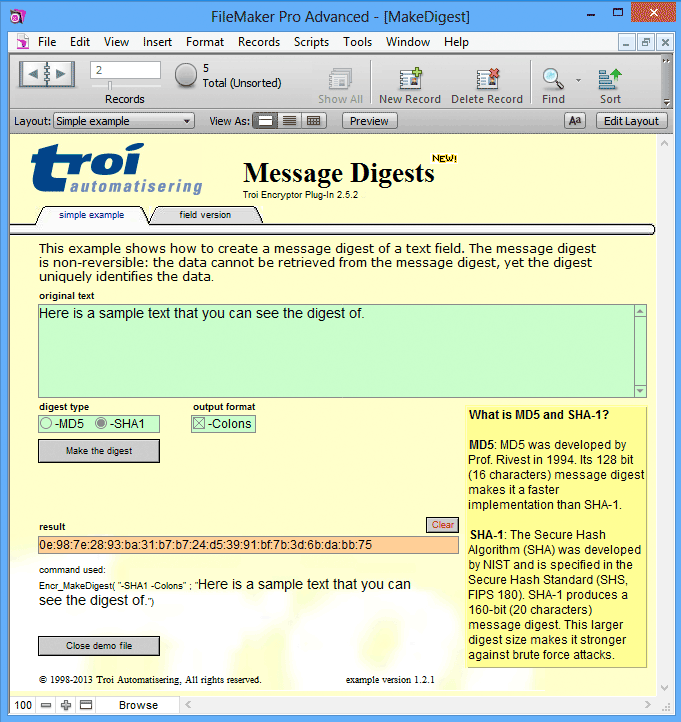 Updated the user guide: clarified the format of TROI_AES the plug-in generates and added a section about exchanging data with OpenSSL. (macOS) Fixed a compilation problem with code signing and extended attributes in macOS 10.12 (Sierra) and later. Improved and updated the registration of the plug-in. Updated the User Guide and the Reference.fmp12 file. The Encryptor Plug-in adds multiple script steps when running FileMaker Pro 16. NOTE Only steps that perform an action have been added as a script step. Functions that just manipulate data and have no side effect (like for example Encr_EncryptRijndaelAES) are only available as an external function. Added new scripts to the EncryptAES.fmp12 example file, which demonstrate how to use the new external script steps of FileMaker Pro 16. The examples check if FileMaker Pro 16 is running and will select these new scripts. Encr_SavePasswordToKeychain, which saves a password into the keychain (for an account or your ID). Encr_GetPasswordFromKeychain, which retrieves a password from the keychain (for an account or your ID). Encr_DeletePasswordFromKeychain, which deletes a password from the keychain. The type-ahead information is used by the auto complete functionality of FileMaker Pro 15. In the calculation pane of the Specify Calculation dialog box you can type a letter or two of the function name and instantly see a list of matching function names. For example when you type “aes”, the auto complete functionality will suggest the Encr_AES_EncryptUsingKey function. You can also type a function name in the functions pane on the right: for example if you type “Encry” you will see all the functions with Encrypt in the name, like Actr_EncryptRijndaelAES. Tested and made compatible with Windows 10 and OS X 10.11 (El Capitan). Fixed a bug in the Encr_MakeDigest function which was introduced in version 3.0: when creating a MD5 digest an incorrect digest would be returned for texts bigger than 32000 characters. Added a switch “-DigestCompatibleWithv30” to the Encr_MakeDigest function, to be able to generate the same (incorrect) digests of v3.0. Note that the result only differs for digests of text bigger than 32000 characters and created with the 3.0 version of the plug-in. Tested and made compatible with FileMaker Pro 12, 13 and 14. Added support for 64-bit architecture with FileMaker Pro 14: on OS X the 32-bit and 64-bit version is a single universal plug-in and on Windows there are 2 plug-ins: Troi_Encryptor.fmx (for 32-bit) and Troi_Encryptor.fmx64 (for 64-bit). Added the example file EasyInstallTroiPlugins.fmp12, with support for the 64-bit version of FileMaker Pro 14. Tested with OS X 10.9 Mavericks, OS X 10.10 Yosemite and Windows 8.x. Added AES-256 bit encryption: The function Encr_EncryptRijndaelAES() will now use AES-256 bit encryption by default. Added a switch to the Encr_EncryptRijndaelAES function: “-KeySize=128”, which will generate AES-128 bit encryption. Improved the Encr_DecryptRijndael function: for Troi AES encrypted text, it will automatically detect if it is AES-128 or AES-256 and decrypt the text. You don’t need to change the scripts or add any switches for this to work. Encr_AES_CreateKeyAndIV: creates an encryption key and initialization vector, which can be used for the AES encryption or decryption. Encr_AES_EncryptUsingKey: encrypts the data using the AES-128 or AES-256 algorithm using the encryption key and initialization vector. Encr_AES_DecryptUsingKey: decrypts the data using the AES-128 or AES-256 algorithm with the encryption key and initialization vector. Added PHP mcrypt script which demonstrates how to decrypt data generated with the EncryptAES.fmp12 example file in PHP. Troi Encryptor Plug-in is now compatible to run under FileMaker Server! The plug-in creates log files when running under FileMaker Server to make troubleshooting easier and to provide feedback regarding errors and registration status. Note that you need a special Server/WebEngine license to use this plug-in on FileMaker Server. See our web site for details. Added new Encr_VersionAutoUpdate function. The Encr_VersionAutoUpdate function is part of a standard for FileMaker plug-ins of third party vendors of plug-ins. The version number is returned in the format aabbccdd where every letter represents a digit of the level, so versions can be easily compared. Fixed a bug in the Encr_DecodeBase64 function, where ASCII character 240 (Apple logo) and ASCII character 189 (Omega) would not be added to the result. Updated information regarding MD5 hash and collisions/uniqueness. Now recommends the use of SHA-1 when more security is needed. Added new switch -GetRegistrationState to the Encr_Version function: this switch allows you to check if the plug-in is currently registered. Added new switch “-GetPluginInstallPath” to the Encr_Version function: this switch will return the path where the plug-in is installed, for example “/Mac HD/Users/User Name/Library/Application Support/FileMaker/FileMaker Pro/14.0/Extensions/Troi_Encryptor.fmplugin”. Added new switch to Encr_Version: -UnregisterPlugin. This will remove the registration data. The plug-in will be in the unregistered state after this. Made various changes to several example files. For older release notes please see here, including the release note for Troi Coding Plug-in, the original name of Troi Encryptor Plug-in. If you have a license for a previous version, you can buy an upgrade for version 5.0. If you bought a license on or after August 15, 2017, the upgrade to version 5.0 is FREE! Note: eligible users have been sent a new 5.0 registration. Contact us if you have not received yours. We are still collecting more comments. If you have any remarks on the Encryptor Plug-in please send us your comments. Thanks!